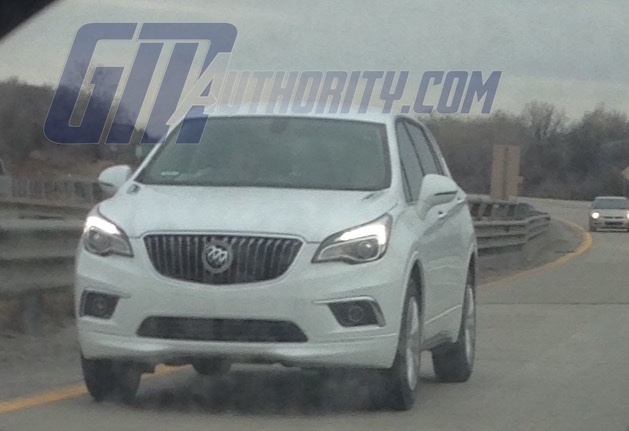 Behold the Buick Envision crossover driving on U.S. roads, without any camouflage while wearing Manufacturer plates. Though the compact, D2XX-based crossover is already on sale in China, GM has yet to confirm or reveal plans to sell it in North America, though unofficial reports state that it will launch in America in the third quarter of 2015. The automaker has also not commented on whether the vehicle, if and/or when it reaches North American shores, will be called Envision or Anthem. 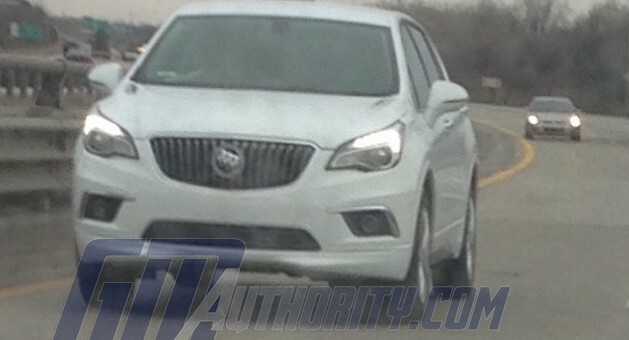 Notably, as reader Chris mentions in the comments, the vehicle seen here wears a monochrome Buick Tri-Shield emblem, while the Envision sold in China features a red, white, and blue badge. 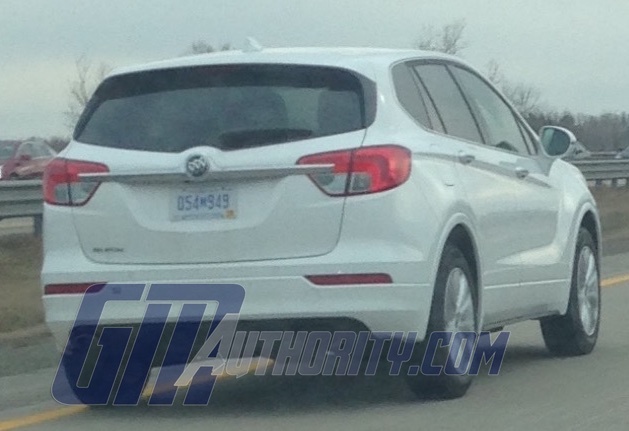 Nevertheless, seeing this white Envision driven by GM in Michigan gives us hope that the compact crossover that Buick desperately needs will go on sale here at some point in the future. Hat tip to GM Authority reader Noah for capturing and sending in the photos. 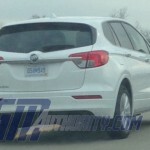 Perhaps some GM person could give us some specs for this mid size CUV , ie length , width , wheelbase ?? It will give us an idea as to what part of the market segment , it plans to compete in ! Really looking forward to the official reveal of this vehicle. Much needed for Buick. 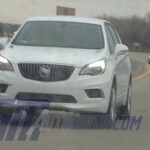 I see it as Buick ‘ s volume leader. Buick NEEDS this vehicle ASAP. I don’t understand why they are dragging their feet. One thing worthy of note is that the tri-shield appears to be different from the red white and blue on the Chinese spec model. You’re right — the Tri Shield is monochrome on this one (as are all other U.S.-spec Buicks) whereas it is red-white-blue on the Chinese-spec model. Good eye! Do we like this better then the new Equinox? Even though they are different platforms, Im thinking so! I do. I think the Equinox is moving to the same D2XX platform in 2017. Thanks Silent Electrician….I’m concerned that the size of this CUV does NOT represent what Buick needs to do with this CUV to be a big hit in this segment . The width is only about 72 inches , the Encore is 69.85 ,,length of the Envision about 7 inches longer or about 175 inches . Compare this to the hugely popular Ford Edge with a width of 75.9 , length of 188 inches . Not that the Edge is be all , end all , but its size is definitely on the small size for this trending mid size segment . You only get one chance to make a first impression and I’d encourage Buick to expand this model for North American buyers , considering the growth of demographics where N. Americans are getting wider and taller , plus your competition will be upsizing a bit , guaranteed ! What Buick needs is a compact crossover. The Envision is a compact crossover. When you look at sales figures, the compact segment is the most popular by a wide margin. So in your example, have a look at the Ford Escape (although the Buick isn’t a direct competitor to Fords today, given Buick’s luxury focus). A compact CUV should be priority #1. A midsize that’s larger can follow, but won’t enjoy as high of demand as a compact. Unfortunately this was to be revealed at an earlier U.S. Auto show but the UAW is holding it up at this point as it is not slated for U.S. production at this time. They would be coming in from overseas. That would make for one sleek Chevrolet if the grille was horizontal Impala like. The Equinox from what I gather is getting a tad smaller on the outside to more match it’s inside like the Captiva. Which by the way, dealers can’t keep in stock because of it’s Escape like sizing. So wouldn’t they have room for something like this? Normally a Trailblazer would have filled that spot. Or is there a Trailblazer coming for Chevrolet? If not, this would be the next best thing. I agree Sonic Man, this blows the Equinox out of the water. 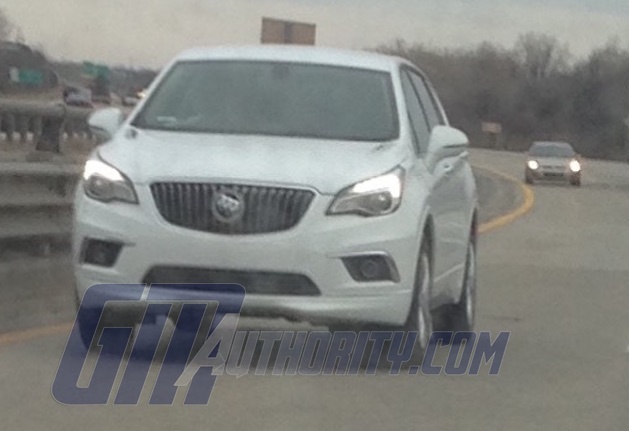 I think most Buick designs of the last 5 years have put Chevrolet’s to shame though. Sadly. M S Myers is correct. Two GM execs at Cleveland Auto Show shared that UAW is the issue. Was going to build in Tennessee, but apparently cannot come to terms. I would love to own this vehicle, but will not purchase if manufactured in China. I believe you, Hal! The UAW has known about this car for a year or more now. Now with a new contract soon to be settled to find out only the LaCrosse and Enclave to be US built. I like this as it looks to be about the right size, not too small like the Encore. Not too fond of the import from China bit, but hey the first Regal models came out of Germany. 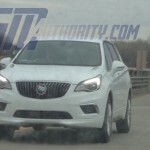 Same design style as Insignia/Regal…. I drove buicks for years, but they made a big is stake by ending the la Sabres era they were the best cars I ever drove. I drive a Lexus now, but I am open to a 2016 envision it looks like it is good car for all style families young and old. Get on the road in the U.S. Rual areas of America soon.